I've always been fascinated by masks and the idea of transformation. The notion that we can change our identity by putting on a different face has universal appeal. The mask as a vehicle for transformation is ancient. Representations of masked dancers have been found in rock paintings dating back to the Stone Age. Living in Tucson in the late seventies as a University of Arizona student, I began to develop an affinity for Mexican culture and folk art. As I've learned more about the use of masks in a broader world context, I've grown to appreciate Mexican Masks and folk art in particular. I began my collection in 1989. The skill, passion and creativity involved in mask making are irresistible to me. The materials used reflect the creativity of village artisans. Animal hair, bone, bits of broken glass, horn and other materials become sacred in the masks. No one better embodies the skill or passion for the work than the first mask maker I met, Herminio Candelario of Suchitlán, Colima. Working with crude tools and a badly infected thumb, he carried on the work that has been in his family for five generations. Masks and costumes were used in local rituals, some of which survive to this day. These ceremonies honored the vital necessities of daily life: water, sun, fertility, fishing, and even death. My collection includes pieces that have been used in ceremonies and others that were made for sale. Many date from the 1940s and 1950s. 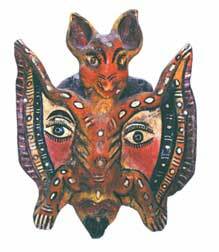 Masks have evolved as a folk art tradition from the practice of making masks for ritual use.